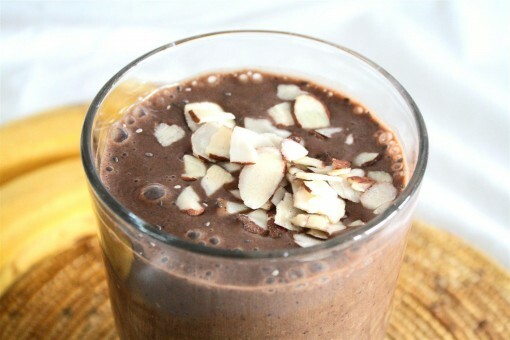 Choconana Smoothie was posted on February 21st, 2011 and is filed under Breakfast, Dairy Free, Drinks & Smoothies, Recipes, Vegan. This entry has 10 comments. You can follow any responses through the RSS 2.0 Comment Feed. When I made up this drink I had just finished a 3 mile run, and somehow after a good workout a blended drink is what appeals the most to me. Your body is overheated, you’re sweating, the thought of eating anything heavy doesn’t sound good, and you want something fast, preferably with protein. So I will usually make myself a smoothie, maybe add some extra ice, enjoy it immensely and then proceed to be very cold. Winter smoothies are a sensitive situation. It seems I can only drink them after a good workout when I’m boiling and my face is red. But once I have my bath and my hair is wet, then I’m usually cold for the rest of the day. So there’s only a small window of time when I’ll actually want one. I know. I make life complicated. And yes, I could blow dry my hair to be warmer, but I think hairdryers are an enemy to long hair… so I avoid them except in an extreme hair emergency. Like I said, quite a sensitive situation. This drink is chocolaty, smooth, and a bit thinner than the ones I usually make. I often just eat my smoothies with a spoon, but this is more of a drink, so you don’t need to (I still did though…because I like spoons. I like eating from spoons. I like holding spoons. Spoons are nice.). I also threw in the mix a couple super foods, a teaspoon of maca and a sprinkling of organic blue-green algae flakes. Completely optional. I like to make my drinks as loaded with nutrition as possible. When foods are blended well, it is so much easier for us to glean the benefits because everything is broken down and easily digested. Today: Happy Family Day for the Canadians (and Happy President’s Day to my American friends!)! Today (and yesterday) we’ve been celebrating it in full force with my entire family, which includes a lot of nieces and nephews, big meals, games, sledding, and a lot of laughter. I’m so blessed to be part of a big family! So now I’m off to play some good ‘ole Foosball with the nephews and one of my nieces. We have a tradition of having a little tournament whenever we get together…lots of screaming happens because we’re all pretty competitive! What are your favourite post-workout snacks? And what are you doing to celebrate today? Just looking at these pictures has given me a major smoothie craving …. Yum! 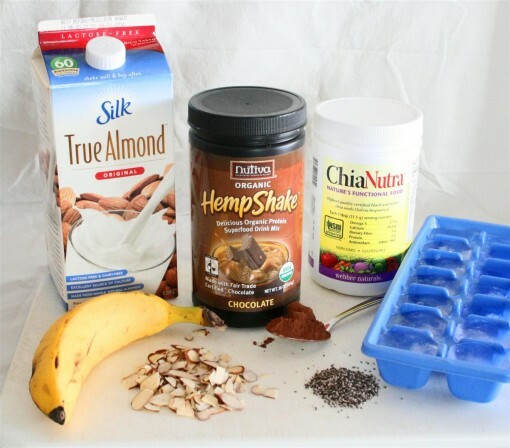 I’ve never tried hemp protein powder. Is it chalky at all? Rice protein is alright but pea protein is terrible! I’m currently researching on a recipe for a multivitamin shake based on the latest RDA guidelines and hopefully will get that post up soon. My favourite post workout shake is anything with frozen berries! Eugene- No, I don’t find it chalky…but then, I always whiz it up in a smoothie. I don’t drink it straight with water. Looking forward to your recipe! Yum that looks good! Unfortunately I can’t buy the Hemp Shake here in Holland. So sad. I hope one day they start selling it here too. I’ve heard it tastes really good. Does it? Yeah, I do like it…but frankly, the chocolate version isn’t “chocolaty” enough in a shake for me…so I always add a teaspoon or two of cocoa in addition. But as far as the nutritional info goes…it stacks up impressively! Mmmm I’m going to try this one! 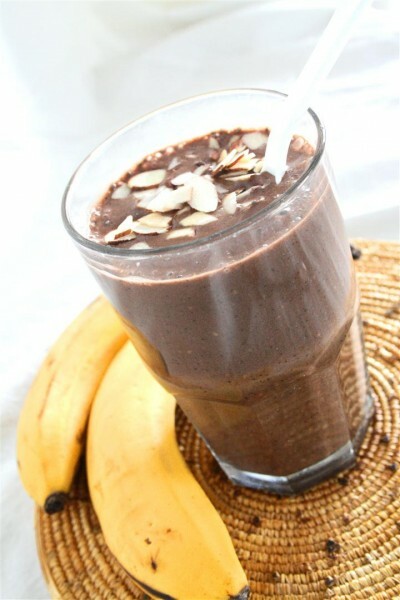 Chocolate & banana is always amazing post run!